Crissa Stone is a career criminal who has pulled a number of impressive heists by knowing how to keep her mouth shut and her temper in check. Still, as good as she is, she wants to get out of the life. All she needs is one last big score, enough to bribe her lover's way out on parole, set up a safe and stable new life, and get her daughter back. However, things keep going wrong, like when her last two partners lost their cool and fought over the take instead of walking away $150K richer. The mess they made of the job and each other has put her on the run again. She's not the only one. Benny Roth, a former mobster, has been straight for years, but now he has his own problems. A face from the past has popped up to tell him that boss Joey Dio is finally dead and to ask about the five million dollars that Joey was rumored to have stashed away years ago. Benny denies knowing anything about it and claims he's out of the business. That may be what he says, but he's willing to risk almost everything for one last shot. With the law and mobsters on the lookout and five million dollars on the line, it isn't long before Crissa and Benny find themselves on a collision course that neither of them can avoid. 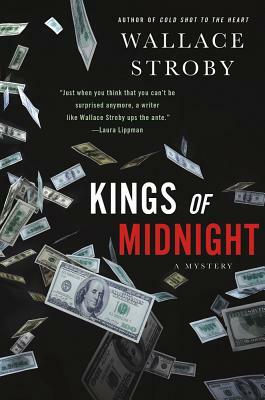 This hard-boiled world, where the stakes---and the risks---are always high, unfolds at breakneck speed in "Kings of Midnight, "another dark and thrilling masterwork of crime fiction from Wallace Stroby. WALLACE STROBY is an award-winning journalist and a former editor at "The Star-Ledger" in Newark, New Jersey. "Kings of Midnight" is his fifth novel, following the acclaimed "Cold Shot to the Heart" and the Barry Award finalist "The Barbed-Wire Kiss." He lives in New Jersey. The. . .power lies in Wallace Stroby's uncannily exact imagery, precise language, and narrative credibility. Stroby's depiction of heists is so believable you almost wonder if writing is just a sideline for him. . .Economy of language has been a key element of crime fiction since the days of Dashiell Hammett, but Stroby makes it feels fresh and vital again. . . Kings of Midnight is remarkable for its stylistic rigor. There's not a word out of place, no detail that isn't essential to the story. . .This is what hard-boiled writing should be. Stroby seems to get better book by book. This one offers plenty of excitement and plot twists, a solid body count, and vividly drawn characters. Crissa is crime fiction's best career criminal since Richard Stark's Parker. . .The Kings of Midnight puts Stroby in the same league as Stark (a pseudonym for Donald E. Westlake) and other exemplars of hard-edged crime. As coolly efficient and professional as its heroine, this thriller evokes Donald Westlake's Parker novels with lean storytelling that pauses only for meticulously detailed descriptions of criminals at work or in conflict. Cold Shot to the Heart moves at a break-neck speed. . .Fans of Elmore Leonard and George V. Higgins's The Friends of Eddie Coyle will find much to like. Another fast, taut winner from Stroby. As for Crissa, she may be crime fiction's best bad girl ever. Just when you think that you can't be surprised anymore, a writer like Wallace Stroby ups the ante. "This hard-boiled novel, filled with believable characters, puts author Wallace Stroby in the company of noir masters like Dashiell Hammett and Elmore Leonard." A scorching first novel that mixes the melancholic heart of tough-guy fiction with a fierce and violent gangster plot. Stroby does wonders with his blue-collar characters.